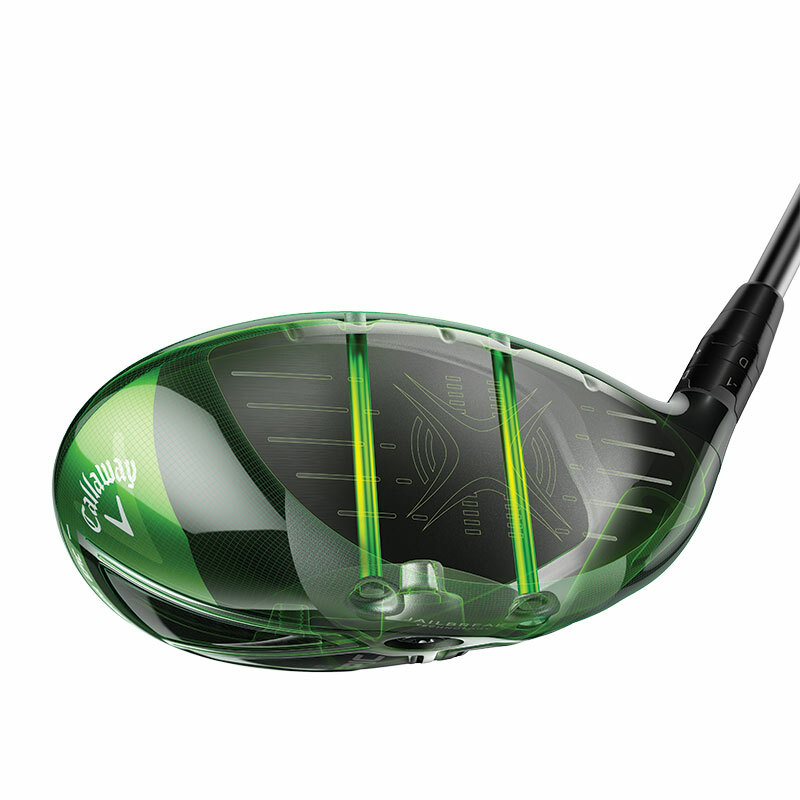 CARLSBAD, Calif., January 4, 2017 — Callaway Golf Company (NYSE: ELY) today introduced the Great Big Bertha Epic Sub Zero Driver, a true paradigm shift in tour driver performance. Epic Sub Zero’s power is based on Callaway’s innovative new Jailbreak Technology, which fundamentally changes how the head and clubface behave at impact to deliver more ball speed and distance. At impact, a metalwood’s face flexes and the crown bulges upward while the sole bulges downward. Jailbreak bars form a firm connection between the crown and sole to inhibit their flexing. That puts more of the load of impact on the face. Physicists call this “energy lensing.” In Epic, it promotes faster ball speed for more distance. “Jailbreak Technology creates a new and remarkably efficient working relationship between the face, crown and sole to promote faster ball speed across more of the face to give the golfer more distance,” said Hocknell. Epic Sub Zero’s clubhead consists of Callaway’s aerospace-grade titanium Exo-cage outfitted with a crown and sole panels made of triaxial carbon, an extraordinarily light and strong composite material developed by Callaway. A full 50 percent of the head’s surface area consists of triaxial carbon. The crown weighs just 10.8g, the sole panels just 7.4g. The weight saved is strategically repositioned to create Epic Sub Zero’s extraordinarily high MOI (or Moment of Inertia), which measures a full 40 percent higher than the Big Bertha 816 Driver (when Epic Sub Zero’s heavier interchangeable weight is in back). Two interchangeable weights (12g and 2g) positioned at the front and back of the sole, which can be used in tandem with the Optifit hosel, give players the ability to adjust the spin-rate, the launch angle and MOI. Epic Sub Zero’s unique head construction allows Callaway engineers to position the Center of Gravity low, deep and in line with the head’s neutral axis, which is defined as a line that intersects the geometric center of the face and runs perpendicular to the loft. The CG location, in particular CG height, is often measured relative to the neutral axis. Head speed gets a boost from Callaway’s Speed Step technology. Designed with the direction of aerospace experts, the Speed Step, located on the crown, improves aerodynamics for more speed and distance. Four premium, Tour-proven stock shafts are available, all engineered to deliver an outstanding combination of speed, power, feel and control. A long list of custom after-market shafts is also available. GBB Epic Sub Zero driver availability begins January 27, 2017 at a new product introductory retail price of $499. Also announced today, Callaway Golf will bring a complementary Great Big Bertha Epic Driver, also featuring Jailbreak Technology, and a full line of GBB Epic Fairway Woods. These clubs will also be available starting January 27, 2017.